In the clutter of online ads, social media and business content, one single factor gives you 4 times the visibility of your competitors. That factor is branding. The benefits of branding for the future are well-documented and seemingly endless. Branding drives costs down throughout the organisation while increasing revenues. Branding supports all of your marketing and advertising efforts, helping you work more efficiently. Get the most for your investments into the company. What other benefits of branding do you need to know about? Read on to find out. In some industries, it’s not easy to stand out. You may have many competitors doing more or less the same thing. You’re caught in a position where you’re simply sharing a huge customer base with a lot of different businesses. Many businesses are faced with this. They often like to think that customer service standards set them apart. But the fact is that every business is trying work this angle. They know how important customer experience is to people. One of the major benefits of branding is how it helps you step out of the cookie-cutter mould that most of the similar businesses remain stuck in. People know you not just for what you do or sell. They recognise you as a brand. You now influence how they see that brand. It gives your nearly identical products or services a huge boost just because they are provided by a name that people have learned to appreciate and trust. Are you a new player in an industry where major competitors have already gobbled up market share? Have they already built strongholds of loyal customers? It might seem impossible to compete with these giants. But branding is how it’s done. Establish your business as the better alternative to these big names. Find and build your brand around a niche audience to which your business will be seen as superior in some way. Your business can become the eco-friendly option. You can be seen a more personalised in your approach. Consider who your most likely customers are. Start building a brand that very specifically speaks to their unique values, interests, challenges and goals. Carve out your edge in a competitive market. Then grow from there. Have you ever been on a random website ready to buy something? You have your cart filled and that credit card in hand. Then you start to second guess yourself. How do you know if this is a legitimate business? Anyone can create a website and say almost anything they want. You head over the Amazon to buy it instead. An unscrupulous seller can just as easily be on Amazon. But it feels safer because a brand has been built around it. Think about this in brick-and-mortar terms. If you need your car repaired, do you go to the dealership? Or do you go to an independent garage you’ve never heard of? Unless you received a great recommendation, you’ll likely go with the one you know. Whether you’re an online business or brick and mortar, all consumers will have some “trust issues” with businesses they don’t know. Because of it, they either don’t buy. Or they buy in small quantities to test the waters. Both of these cost you as a business. Earn the trust that makes people confident in their purchases by building a brand. Branding complements each stage to both speed the journey up and make that journey more valuable to you. Branding makes it easier for potential customers to find you. They see you on social media. You have lots of reviews from customers. When they do a search in Google, your website appears either through ongoing SEO or search engine advertising. Both are important to branding and benefit from it. Because they recognise and trust your brand, they’re more likely to notice your ads and click on them. If they see that your brand shared something on social media, they’re more likely to check it out because of the brand behind it. This makes it easier and faster to consider their options and choose you. They may not even need to look at other brands. There may be little to no hesitation to make that purchase. They know you. They trust you. They have built positive emotions around your brand. They don’t wait to buy. 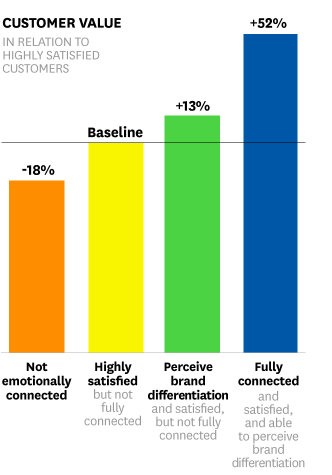 65% of people say that they have strong emotions around the brands they buy. 90% of these emotions are positive. Everything from electronics to fashion to food elicit emotional responses. Branding helps you stay top of mind. Existing customers want to purchase again sooner. They follow you online. They’re on the lookout for your next product release or a special promotion. They’re ready to buy again at any moment. They feel connected to your business. A Harvard Business Review study found that customers who are fully connected to a brand are worth 52% more to a business than someone who isn’t. Without branding, people don’t feel connected. They can’t distinguish one business from the others. In fact, the same study found that businesses without any branding to connect with people had a -18% customer value. Customers cost them more to acquire than the revenues generated! People buy. Then they don’t come back. This drives acquisition costs higher and higher. This isn’t a sustainable business plan. It’s easier to up-sell on an order when there’s a brand behind it. Because the brand has set an expectation that they’ll be very happy with the order, they’re comfortable buying more now. They don’t have to wait and see. It increases the average order size significantly. Not only do people buy more when they buy from brands. Brands can also charge more. One of the benefits of branding is that it creates a perceived value beyond the fair market value of an item. Think about it. Are you willing to pay more if you know that something will be of higher quality? Branding can help establish an expectation that something is higher quality than the competition, even if the difference is minimal. Do you pay more for an item because you also want to “own” the brand? It may be a certain brand of watch. A car. A handbag. A smartphone. It may be something as seemingly insignificant as the coffee you get each morning around the corner. Or your bottled water brand of choice. You want people to see that you own that brand. Psychologically, it might even make you feel more important because you use that admired brand. You may even be in a professional or social circle where owning a certain brand is expected. Owning a “knock-off” or generic is looked down upon. Why do we pay $4 for bottled water that we could get for $0.05 from the tap? It’s mostly about branding. Each of these mentalities contributes to people’s willingness to pay more because of the added benefits. Some of them are real. Others are simply good branding built around a feature that might otherwise go unnoticed and under-appreciated. How much time and money do you spend trying to get new business? In the early stages, you spend more time doing outreach than you do business. One of the benefits of branding is that the larger it gets, the more magnetic it becomes. Be found organically because people are drawn to your brand. They hear about you from their friends. They keep seeing you where they are. Isn’t this how you want to get new business? Nearly 80% of people say that “name recognition” is the #1 reason they click on a search result in a search engine like Google. 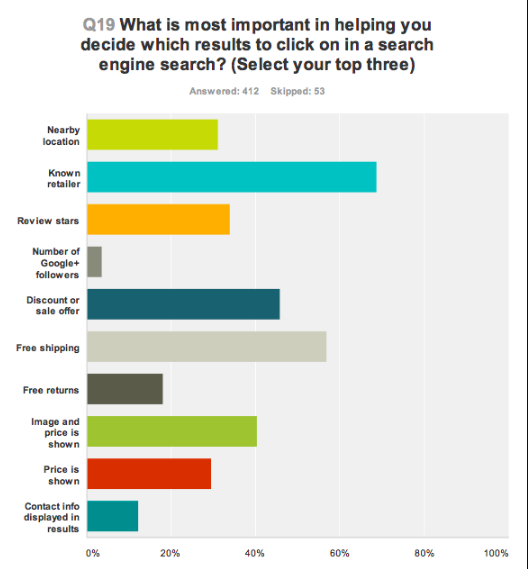 You could be doing everything right to optimise your site for search engines through search engine optimisation (SEO). But if they don’t recognise your brand thanks to strong branding, they’re not likely to click your website. Your employees are the lifeblood of your business. You need the right people in the right positions to make money for your business. They help you deliver the expected results to customers. One of the little-known benefits of branding is that it makes it easier to recruit top talent who share your company values, work ethic and mission. A report compiled by the people at LinkedIn found that a great brand can decrease hiring and training costs by as much as 50%. People really want to work for you because they have a brand they can stand behind. They feel good about being a part of the brand. We’ll throw in just one more of the benefits of branding related to employees. Losing an employee costs over $15,000 on average. Lost productivity, time spent training and actual recruitment costs all contribute to this high price tag. Branding increases employee loyalty. Loyal employees are as much as 300% more productive than employees with a foot halfway out the door. Branding saves you money in the human resources department and makes you more revenue. When you’ve built a brand, people just keep coming back. Branding creates tunnel vision. People don’t even consider the alternatives. If you’re considered the only option, it’s harder for competitors to “steal” customers. That magnet you’ve created not only attracts customers. It keeps them. These also happen to be the 4 major components building of a branding strategy. No, really, that’s not a coincidence. Branding is all about providing a consistent, quality experience at a price that the target customer is willing to pay. Customer loyalty is a lot more than just having repeat business. A loyal customer will always see the best in you even when you make a mistake. A loyal customer will go to bat for you if you get some bad publicity. Often the negative comments of others bring them even closer to your brand. In a massive consumer study, researchers observed the consumer behaviours of 24,000 people. They found that around 37% of those studied are “brand loyalists”, meaning they look for brands that they can align with. They want brands to support in the ways described above. Another 40% of the participants stuck with a brand default unless they were given a compelling reason to switch. If you have no real brand, this 77% of people may try your product or service. Then they’ll find a brand that either becomes their default or loyalty choice. Your loyal customer goes out of their way to share your brand with others. They write some of your longest and most glowing reviews. They want others to use your brand. When others use and appreciate your brand, this makes the loyal customer feel good because they recommended it. When you know who you are as a brand, it’s easier for your business to make decisions with that brand in mind. If you’re considering moving into a new market or introducing a new product line, you think of its impact on the brand. When you run a Google Shopping Ads Campaign or add a new element to your website, the brand is at the forefront of that decision. Your brand is like the centre pillar around which everything else is built. This means that your customers get a consistent experience. They have an unwavering image of what your business is. Because they know what the expect, they can feel confident in putting their trust in your business. Now, we get to the really good stuff. Have you ever been infuriated with a bad review? It was obvious from the comments that the person had certain expectations that don’t align with what you actually do. Or your products or services just weren’t a “good fit” while someone else would have appreciated them. This happens when a business doesn’t have a clear brand. One of the benefits of branding is that it’s clearer to would-be customers whether you’re a good fit for them before they buy. There’s less chance that people who won’t be happy with your business will choose you over a competitor. While this may feel like “losing customers”, know that it never actually plays out like that. For every 1 customer who you won’t attract, you’ll attract 10 more easily because it’s clear what your brand is. Building a Social media presence is a great way to share with potential customers who you are to attract the target customer. Build content around your target audience to showcase who you are as a brand. When you attract a narrower target, you get to work more to your strengths. For example, you’re a real estate agent. You love to work with people selling luxury homes. It’s your passion. And you’re also really good at it. Not everyone is. Can you sell a mid-priced condo or smaller single-family home? Sure. You have those skills. But by branding yourself as a luxury home seller, you get to work in the area of real estate you really love and can do your best work. In a small business, all employees will be more productive when your business is working to its strengths. Working to your strengths allows you to wow people almost every time. You’ll get more amazing reviews. As these reviews build, more people will see your brand and want the same experience. And the benefits of branding continue to multiply. Businesses without brands rarely get unsolicited positive media attention. When reporters know your brand, they’re more likely to mention you. They might ask for an interview. They value your opinion related to an industry trend. Does a local celebrity or prominent business use your product or service? This may be a lost opportunity if you don’t have a brand. If you do have a brand built up around your business it can be a goldmine. Influential business people, industry experts and even celebrities have the power to sway the opinions of others. They often share the brands they use to help others. When others hear them and recognise the brand they’re discussing, a potential customer wants to try it too. But if there is no real brand, then someone might even hear your business name. They make no association with it because there is no branding. They quickly forget it. People go with the name they know. They are more likely to see a name they know. But branding is much more than a name. They may recognise a font, a visual style and communication style, colours or something else. When they see it, it’s familiar. Consistent branding helps your business become a brand that people recognise when they see it. 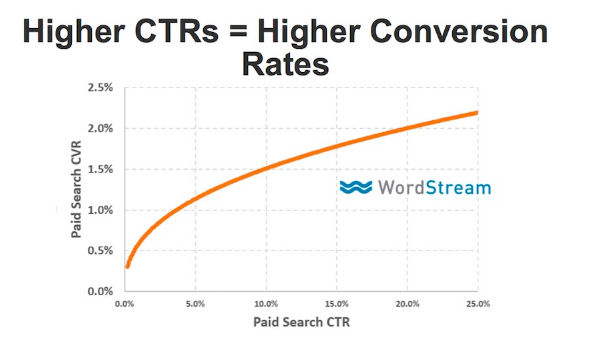 Because they recognise it, they’re more likely to click on ads and make purchases. Check out this data collected by WordStream. 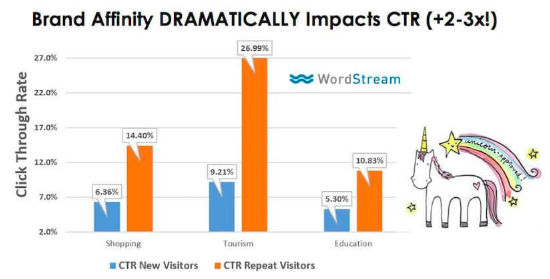 Branding can increase click through rate (CTR) on your online ads by 2-3X. Here’s another chart from WordStream that further makes the case. These are just more clicks. These are also more conversions to paying customers. On top of this, 50% of people on social media follow at least one brand. 29% of people follow up to 9 brands. Branding on social media gives you access to these consumers without having to pay for ads. Create content that they want to share. Reach even more people. Finally, more people are coming to you directly when they need what you offer. They skip the advertising and marketing channels entirely. But you don’t get to this point without branding. Studies show that a consistent brand increases revenues by nearly 25%. It’s not hard to see why after looking at the impact of 1-20 in this list. Keep maintaining that brand and these revenues increase year over year as your brand grows. If something cuts costs and increases revenues, then it maximises your ROI on your marketing and advertising efforts. Make more. Spend less. This is one of the many benefits of branding. How to re-allocate resources in various product lines, departments, etc. A consistent brand becomes the scales by which each decision is weighed. A consistently maintained brand becomes a firm foundation on which to build your business. Risks like casualty losses, leadership loss, economic downturns, bad publicity or a new competitor in town have less impact when a strong brand is built around your business. Not only do these things tend to impact your business less because you’re stronger. Customers who feel connected to your brand will rally around you, helping you weather storms and setbacks. Building a brand has tremendous benefits throughout the organisation. But perhaps the leader among the benefits of branding is how a brand sets you up for long-term success. It’s hard to knock a brand off its “pedestal” once it has achieved a level of branding in a niche or with a broader customer base. Branding is an investment in the future. That includes both the near future and the more distant future if you’re planning to pass a business down to your children. Reveal these benefits of branding within your own company by learning more about the branding process. There are clear strategies you can apply to develop a more consistent brand. Do you need help building a brand that people align with and connect to? Or maybe you’ve built a brand and it just needs some tweaking. We can help you with any of your branding needs. It’s always our goal to help small businesses grow. Contact us today to start your growth journey. Grab the free e-book "How to Write Copy That People AND Search Engines LOVE"